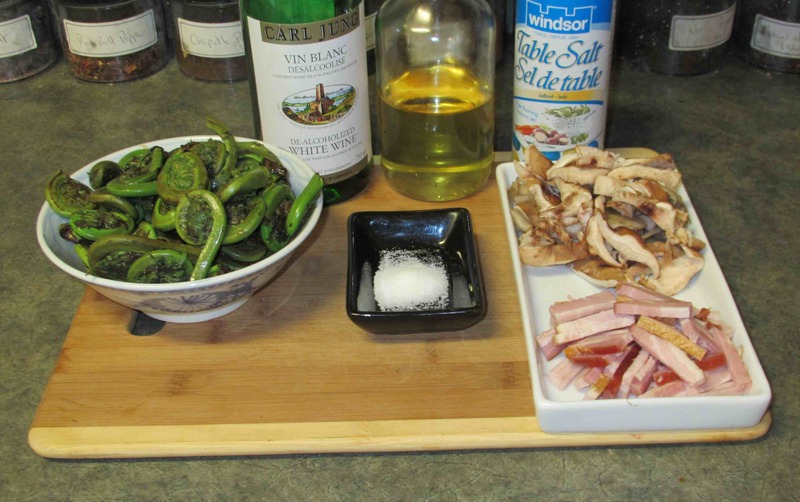 In my ‘Foodstuffs’ post featuring Fiddlehead Greens I mention that, although I ate these very often when I lived in New Brunswick, I didn’t care for them very much as most people there usually cook them by boiling them to death and then serve them with just a little butter or vinegar. However, once I got older and experimented a little, I discovered that if you blanch and then sauté them with different ingredients they can really be quite good. 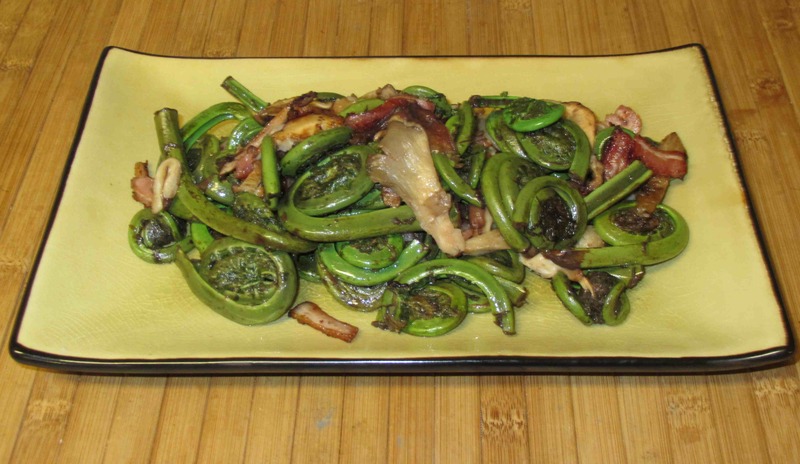 Before you begin, you need to first blanch the fiddleheads in boiling salted water for about a minute or two and then plunge them into ice-cold water to arrest the cooking. Drain well and shake them dry. I am using de-alcoholized wine for this experiment because that is all I have in that house at present. If you are going to use the proper stuff, you may want to allow for an extra glass or two. Heat a tablespoon of the olive oil in a sauté pan over high heat. As soon as it reaches the smoking point, toss in the fiddleheads and stir rapidly for a minute or two. Add a splash of the wine, sprinkle over the sugar and keep sautéing until the wine has evaporated completely. Remove the greens to a separate bowl for the time being. 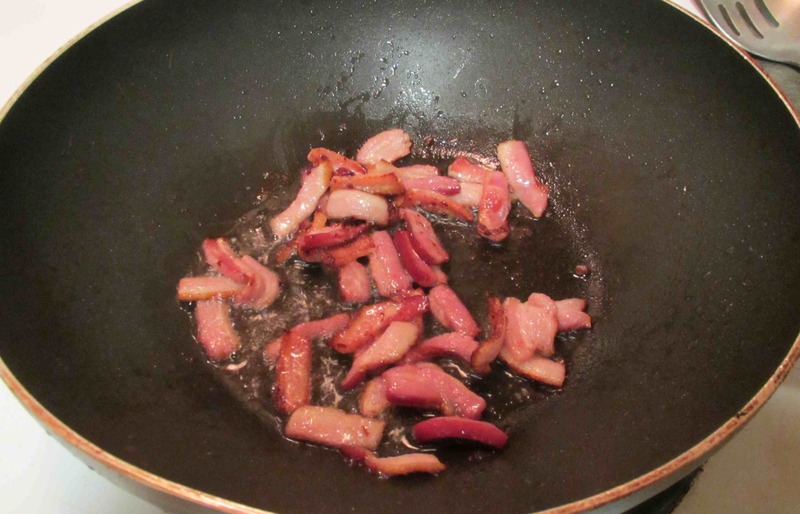 Reduce the heat under the pan to medium and add the second tablespoon of olive oil and the bacon. Fry the bacon until it has rendered its fat and, just as the first few pieces are starting to get a little crispy, scoop out all the bacon pieces, leaving behind as much of the fat as possible, and put them into the bowl with the fiddlehead greens. 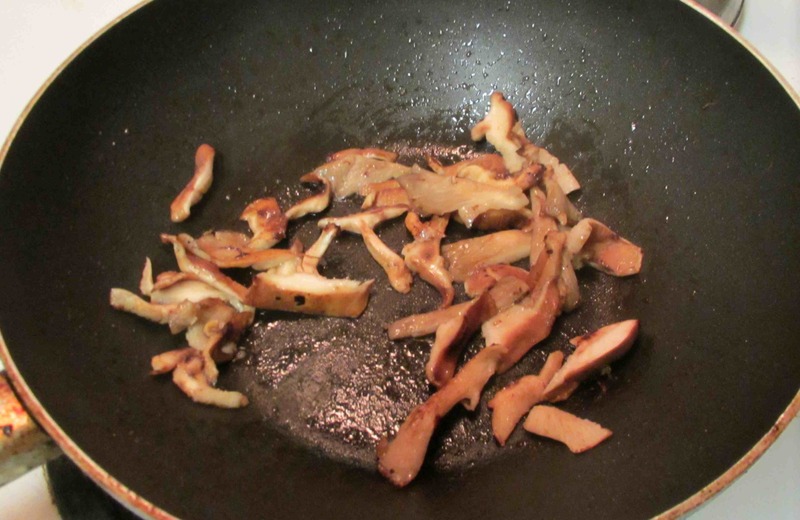 Now, you can sauté the mushrooms. After you put them into the pan, cover them for a minute or so until they throw of their liquid, then remove the cover and continue to cook for a few minutes longer. As soon as the mushrooms are just starting to brown, add back the fiddleheads and bacon. Continue to fry everything, tossing and stirring, for three or four minutes longer until the greens are tender. Plate and serve. Lovely! Bacon and mushrooms can make anything delicious. You are so right bacon and greens make a great partnership. 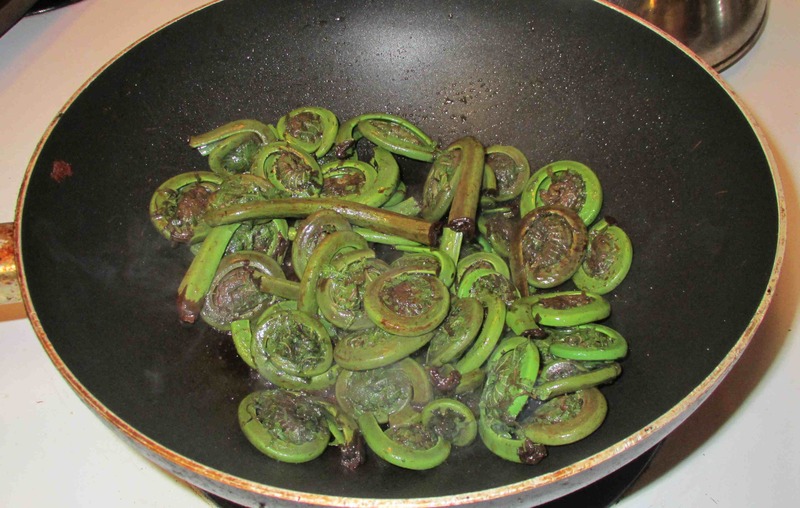 I’ve never tried fiddleheads, or ever seen them for sale – I wonder how they taste. 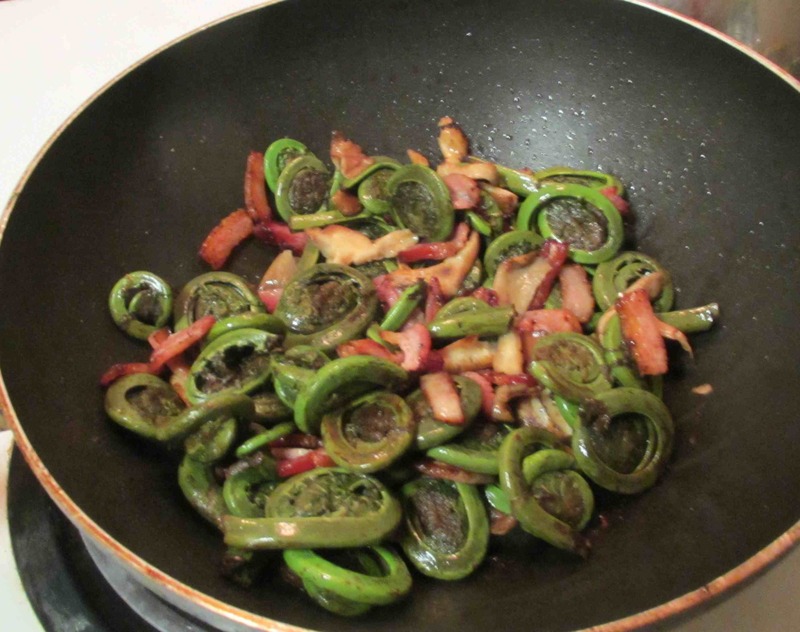 I’ll admit to loving seeing them in the garden, maybe one year I’ll get to try them…..
My Dad was from NB (Grand Falls) and loved fiddleheads. He would have loved this recipe! Glad the recipe inspired you. Yours looks even better. Fiddleheads are hard to come across in the stores around here, but I’ll have to keep an eye out so I can try them. Thanks! What a beautiful plant! I’ve never seen anything like it here in Kansas, but if by luck I ever come across any at the river market, I will definitely be trying the recipe. I’m glad it was a success for you…looks great!